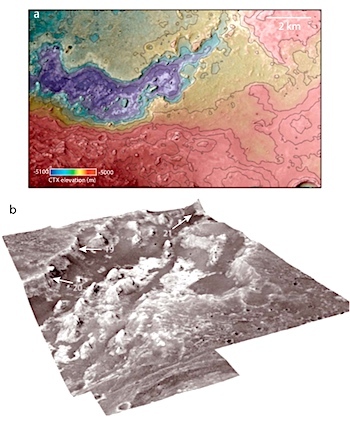 Though Mars is cold, dry, and inhospitable today, it contains evidence for many dry lake beds — relics of an ancient climate that was at least episodically warmer and wetter. Considering that lakes can be an excellent environments for life on Earth, a common thread of Mars research has been to characterize the environmental conditions under which Martian lakes formed in order to better understand their implications for past habitability of the red planet. The goal of this work is to characterize the geology of McLaughlin crater, where a lake existed on Mars over 3.8 billion years ago. McLaughlin lake was vast, deep (~ 500 m), and probably long lived. Many characteristics of McLaughlin lake are unlike those seen in any other ancient lake basins on Mars. This lake contained a range of sedimentary environments including delta deposits, shallow‐water fan deposits, and deep‐water, fine‐grained materials. This entry was posted in Reports and tagged astrobiology, crater lakes, deltas, hydrothermal systems, McLaughlin Crater, mudstones, serpentinite, turbidites. Bookmark the permalink.